Can't attend? Follow ShanghART Gallery exhibitions to know of future events! 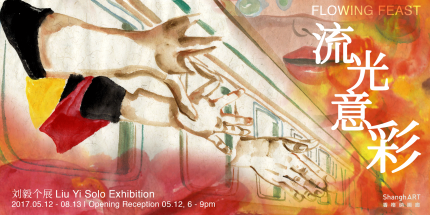 Flowing Feast presents a series of Liu Yi's extraordinary Chinese ink animations, in the form of multimedia installations, alongside the artist’s original hand-painted animation stills. Liu’s unique visual format applies traditional cell animation techniques to Chinese ink painting. Her ink strokes are light and agile, fusing contemporary and classical styles. One of the animations on view, A Crow Has Been Calling for A Whole Day,took Liu almost a full year to complete. Taking the form of a travelogue of Liu’s trip to India in May 2016, the 12-minute film is an innovative combination of documentary footage and Liu’s flowing Chinese ink animations, reflecting Liu’s love of India, her recording of everyday life, and her encounters with love, desires and death. Do join us for the opening reception! The artist will be sharing her experiences and ideas behind each animation and installation. Light appetizers and beverages will be served during the event.